Maximum accuracy and reliability to master every tactical scenario. Bushnell took the bedrock features behind every riflescope they build – optical precision, rugged reliability and uncompromising performance – and pushed them even farther for the AR-platform. AR Optics riflescopes have fully multi-coated optics for incredible brightness and the new Drop Zone-223BDC (Bullet Drop Compensator) Ballistic Reticle has aiming points out to 600 yards and is forged to ultra-tight tolerances. 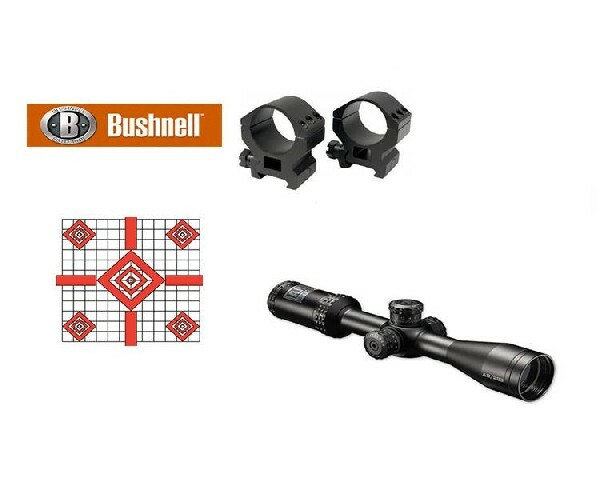 This is a Bushnell-packaged kit containing Medium Height Weaver style mounting rings and 20 targets (may not be exactly as shown in the picture).